Hey Doug, can a sdr like that be controlled by web? So say if I, as a blind user was wanding to use that to stream a weather broadcast, such as what I'm streaming now, with an sdr, is there a nonvisual way to do that? I don't own a pie thus I'm stuck with 2 windows machins, well 3 really and a mac. For the broadcast, it doesn't use any webpages. Only a command line like interface. After initial setup, you use a program such as Putty to remote into it and run commands. But after initial setup, there are few commands you'll need to run. It just works for the most part. About the only thing you might want to do from time to time is update the Jessie operating system. But if you are behind a firewall, you don't really even need to do that if you didn't want to. I will listen to the Stillwater feed real quick and let you know what's going on. The message will be sent after I check. About the only thing I noticed is that it sounds like the station is a tad off frequency. Not by much though, maybe .3 k off frequency so other than that it sounds quite alright to me. Check out http://bhsprn.tk:8000 for all the latest mountpoints streaming from their respective locations. What's not cool is how cold it is in bismark right now. BrandonThis by the way was in reply to the sdr discussion from the bismark end of things. 20 degrees below normal. Expecting 6 inches of snow. I was riding my motorcycle this time last year. Hey that's ok it'll happen. We'll talk about it and it'll change. Friday we had our first round of severe weather since we started streaming KEC56 less than a month ago and it is already being discovered. It is always nice to get positive feedback from site visitors! I found your website, and wanted to say thank you for hosting it. I am happy to find a place where I can tune into KEC56 online. Have a blessed day, and thank you again. We're glad to see the feds up. Let's hope we see more of the coming soon. I wish to remind everyone my server is available for fulltime use now. Hopefully that server comes back up. I'll look and let you know if it's back. Yes indeed, the server at http://wxradio.dyndns.org:8000 appears to be down from what I'm seeing. Using IE it says, "Can't reach this page"
So Wonder if the icecast server is down for maintainence, updates or possibly having a problem. And I was going to add KZZ52 to it's feed list too. Well if nothing else, the bhsprn.tk server is running. What's weird for me is all of my streams are down. I didn't realize Crushed Box was down so I rebooted my PI. After the reboot, my local stream and Broadcastify streams aren't working. Not sure why one being down would stop the other three. If you are using darkice, you may need to remove or comment out the section for wxradio.dyndns.org and restart darkice. Looks like they are back up. All 3 of my streams are active again. Some of you providers may have to restart your Encoders...depending on your settings locally. Doug C and the Team are at it again! That actually sounds really, really good. Keep that descriptiveness because for people who can't see or are totally blind, that's a big big thing. 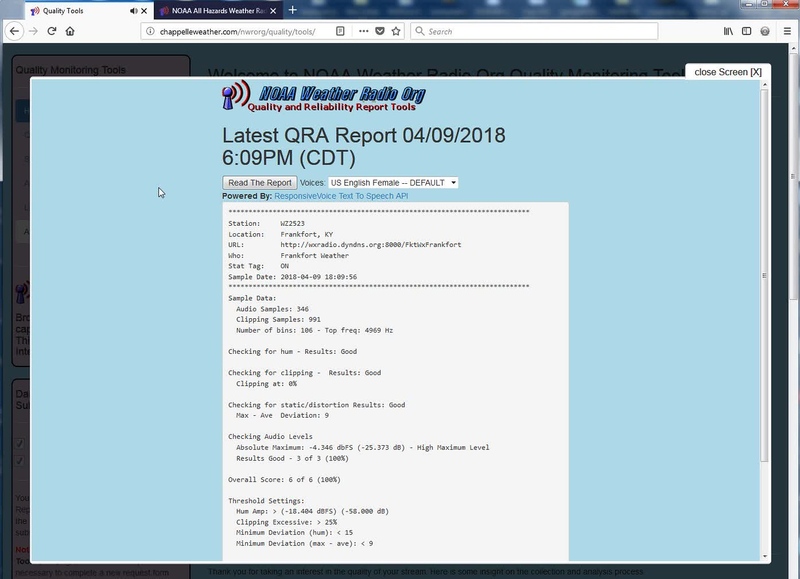 They won't really need their screen reader to do much work other than to read the links and then Click the audio report thing and that'll take care of itself. Some of the material may be later moved to appropriate Quality and Reliabilty pages... maybe. Discontinuance of MOST third party Commercial Website served streams. Amazing and I'm also going to examine this se caster app to see if it's accessible. I'll write back over here to let you know. I don't have another patch cable to tie into the mac to add a second stream of kz52 with the se cast pluggin on it. However, speaking of kzz52, the stream should be much more stable than it had been. Recently, Due to a few technical issues on my dell latitude d630 responsible for the initial stream test, I have moved my base of operation of that stream to my mac mini 2009 model. Using nicecast, it is now streaming the NWR full time. Let's keep up the good work team, you are all doing a finite job. It doesn't appear that the S E Caster, is working nicely with my screen reader, either that or I'm not sure how the input is supposed to look for how to connect it to servers. It presents me with the following line of text, according to the screen reader. I don't know if it wants that all at once or what. But, I shall learn for sure. Maybe if I get it to wor I can see if I can get another radio to stream wxl62 from Sioux city, beings I can get that station also. Pretty soon I'd better get me some more radios. FYI - The Clearwater MN (WNG676) stream provided by Midwest Broadcast Engineering will be down from time-to-time today as we upgrade our internet service. Well if we could get Appleton Minnesota back, aberdine SD, Sioux falls, Hstings Nebraska, Kearny, Cheyenne Wyoming, I for some reason keep thinking there's still a lot more streams missing from the original wu setup, especially from California, we did have ridgecrest at one time, and Yosemite, so yeah, surprised we haven't heard from any of those providers. Oddly once we started the audio feeds from Seattle they went down, so we don't have them either. Page created in 0.058 seconds with 45 queries.